Last week IRS released its most comprehensive report on EITC compliance in over a decade. Called Compliance Estimates for the Earned Income Tax Credit Claimed on 2006-2008 Returns, the report reviews dollar overclaim percentages, which is defined as total dollars overclaimed as a percentage of total dollars initially claimed for EITC prior to IRS enforcement. Those interested in the EITC should read the report. It discusses variables that correlate to higher or lower rates of noncompliance, the main sources of EITC errors by frequency and dollar impact, and the differing compliance rates according to type of preparer. 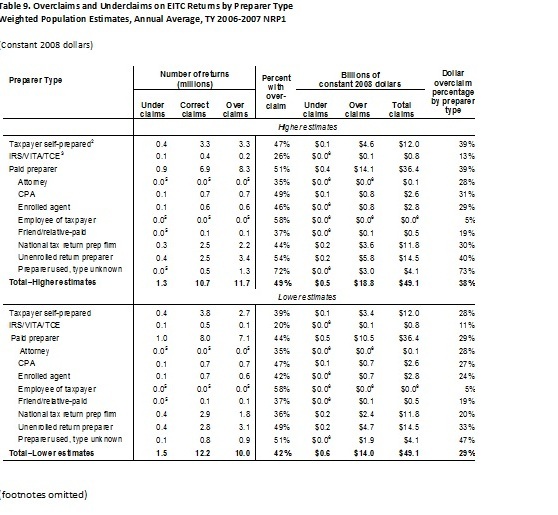 It also details some of the major legislative changes to the EITC since 1999, and notes some interesting trends for periods after 2008, including a substantial decline in the reported use of commercial preparers among EITC claimants. The bottom line from the report is that the 2006-08 results do not differ materially from the most recent prior EITC compliance study that looked at 1999 taxpayer claims. Yet, the growth in the EITC program overall means that similar overclaim rates lead to many more dollars that are improperly claimed, thus likely generating posts or articles reflective of Title B. Interestingly, the report also shows that error rates are higher among returns prepared by unlicensed preparers relative to other paid preparers, self-prepared returns and VITA returns. That will likely lead some to frame the 2006-08 Report in line with Title C.
Taking into account differing estimates to reflect different assumptions for the taxpayers who failed to participate in the audit, the 2006-08 EITC study estimates that the overclaim percentage as 28.5 percent (lower estimate) and 39.1 percent (higher estimate). The two figures, the lower and higher estimates, reflect differing assumptions for the approximately 15 percent of taxpayers who failed to participate in the EITC audits that comprised the National Research Program study that is the backbone of the report. The 1999 estimate comparable figures were 30.9 percent (lower estimate) and 35.5 percent (higher estimate). Opponents of transfer programs generally and IRS bashers will focus on the rates of noncompliance and the dollars at issue—while the overclaim rates have not changed much from 1999, because of the growth in the EITC since 1999 there is a marked increase in total dollars claimed and thus overclaims since 1999. Looking at averages from the three years in this study, IRS estimated that in 2006-08 23.7 million taxpayers claimed an annual EITC total $49.3 billion, compared with 18.8 million taxpayers claiming a total EITC of $31.3 billion in 1999. As a result of the EITC program growth the total overclaims in the study are higher in the 2006-08 Report than in the past 1999 study, with annual overclaim estimates for 2006-08 at $14 billion (lower estimate) or $19.3 billion (higher estimate), compared to 1999 figures of $12.3 billion (lower estimate) and $14 billion (higher estimate). This could very well serve as the justification for what I refer to above as Title B to this post. Depending on one’s perspective, there are differing ways of framing the overclaims in the 2006-08 EITC Report. EITC proponents will note that the overclaim estimates may overstate the true cost of incorrectly claimed EITC. For example, the compliance estimates do not reflect individuals who were eligible to claim the credit but who failed to do so, nor do the estimates account for offsetting errors, where, for example, one parent may have erroneously claimed the EITC but another family member may have been eligible instead. Moreover, EITC proponents may note that the EITC overclaim estimates still are much lower in terms of overall impact on the tax gap, such as small business income underreporting. In discussing the justification for the IRS’s now stalled efforts to impose mandatory testing and education requirements for unenrolled preparers, in my post IRS Regulation of Return Preparers: April 15 Edition I have previously referred to the National Taxpayer Advocate’s testimony that suggested that the NRP results that are the guts of this report showed higher EITC overclaim rates for unenrolled preparers relative to licensed preparers. In response to that testimony and my post on the topic, Loving litigator Dan Alban in his post on Procedurally Taxing called Loving Victory is Final and Why That is a Good Result for Taxpayers and Preparers stated that he wanted to see “the full set of figures” not just the NTA’s “cherry-picked excerpts.” In addition, Mr. Alban and others pointed to TIGTA mystery shopping scenarios of VITA sites to argue that licensing and testing may not have the desired regulatory effect. Twenty-nine percent of EITC claimants self-prepare their returns, compared with 43 percent of other taxpayers. Roughly 68 percent of EITC claimants have their returns prepared by a paid third party, with another 3 percent relying on free tax return preparation services offered by the IRS or IRS-sponsored programs. Unenrolled return preparers are the most common type of preparer chosen by EITC claimants; 26 percent of all EITC returns, and 43 percent of paid preparer returns are prepared by an unenrolled return preparer. There are other limitations as well. As IRS notes, the difference in overclaim rate by type of preparer may be accounted by factors independent of preparer competence or scruples, such as taxpayer selection bias. In other words, the difference may be attributable to noncompliant taxpayers seeking out certain types of preparers, rather than preparers influencing taxpayers. To be sure, the results may be attributable to preparers whose competence or scruples led to or at least facilitated the overclaims. The study does not attempt to characterize the causes, a shortfall that maybe the IRS can take up in future qualitative research studies. Without knowing why the differences exist, those skeptical of additional IRS oversight will argue that the results do not justify the added costs to taxpayers and preparers that come from additional preparer regulation. At a minimum, given how much can be saved by moving the overclaim percentages down even a few percentage points, the differences in overclaim rates justify additional attention to preparers who prepare returns that are more likely to be incorrect and taxpayers who choose to use those preparers. I am partly skeptical of these statistics as regards people who write on their returns that they were “self-prepared”. As the director of a low-income taxpayer clinic, I was constantly having people come in with returns that said on their face that they were “self-prepared”, but the client told me otherwise (which, given the client’s lack of knowledge of how to read the forms, seemed highly credible). I too am skeptical, especially in light of the intensified due diligence requirements. I am not sure, however, if there are studies that back this up. As the Right complains, yet depletes the IRS budget which in turn, reduces compliance audits. And as the article states, it’s but a fraction of small business non-compliance. And Corporate non-compliance. So your argument is to justify dishonesty in one area by pointing out dishonesty in another? That is bizarre, Ted.